The Canadian Armed Forces, as currently constituted, were unable to sustain a small brigade in Afghanistan. In 2011, as our troops left the country Lt. Gen. Peter Devlin, Canadian Army commander was quoted as saying “it will be more than a year after leaving Afghanistan, before the Canadian army is “reconstituted” to a level fit to again deploy in substantial numbers. “We will have the means, by December 2012, to deploy a capable task force – not of this size – to respond if the government of Canada wants us to,” Gen. Devlin said. Approximately 3,000 troops served in Afghanistan at any one time, many had three tours in nine years. This so depleted our armed forces that a time-out was needed to recover. Essentially Canada’s military was paralyzed for a year, unable to contemplate combat missions because of its participation in the Afghan war. How is this possible? Was this situation caused by a lack of troops and equipment and money, or was it a failure of organization? Currently the main strength of Canada’s army can be found in three Mechanized Brigade Groups. These Brigades are made up of regular force units which consist of Headquarters and Signal units, an artillery formation, an armoured regiment, three infantry battalions, a combat engineer regiment and a service battalion. Regular force units consisting of a Helicopter Squadron, a Field Ambulance unit and a Military Police Unit are co-located, and work closely with, the brigade group, but are not officially a part of it. These Mechanized Brigade Groups are headquartered at Valcartier, Quebec, (5 Canadian Mechanized Brigade Group) Petawawa, Ontario,(2 CanadianMechanized Brigade Group) and Edmonton Alberta. (1 CanadianMechanized Brigade Group) with sub units scattered as far apart as Petawawa, Ontario and Gagetown, New Brunswick. While at one time the Brigade groups were differentiated by mission and there were some differences in composition, the current structure has been in place since at least 1995 when Canada’s NATO contribution, 4 Brigade in Europe, was disbanded. The Canadian Airborne Regiment was disbanded the same year. Seventeen years and there has been no important change of any kind in the structure of the Canadian Army. The end of the cold war, 9/11, and our Afghanistan commitment have come and gone, yet this structure remains unchanged. It reflects either a triumph of military thinking and planning or more likely, inertia in action. Five smaller, but still fully functional, brigades stationed across the country in the Maritimes, Quebec, Ontario, the western provinces and the Pacific region, would better deal with these issues. The same number of soldiers could be divided into smaller, more easily deployed brigades. It should be noted here that given our bloated command structure it would not be necessary to promote more officers. These leaner brigades would more nearly resemble the kind of forces we actually sent to Afghanistan. The Canadian battle group that served in Kandahar Province from October 2005 to June 2011 consisted of a full battalion of infantry, a tank squadron, an armoured reconnaissance squadron, a battery of field artillery, and a field engineer squadron. One possible model for these new brigades is a U.S. Army brigade combat team.The BCT is the basic deployable unit of maneuver in the US Army. A brigade combat team consists of one combat arms branch maneuver brigade, and its attached support and fire units. The infantry brigade combat team is organized around two battalions of infantry. 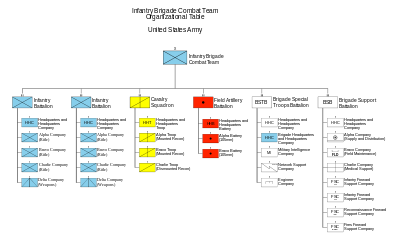 Each type of brigade (light infantry, air assault, or airborne) has the same basic organization. The infantry brigade combat team consists of six units: two infantry battalions and one each of cavalry (RSTA), fires, special troops, and brigade support. BCTs contain organic artillery support. The number of Soldiers in a BCT varies between 3,500 and 3,900 depending upon whether it is a Light, Heavy or Stryker BCT. A brigade combat team is generally commanded by a colonel (O-6), but in rare instances it is commanded by a brigadier general. A brigade combat team carries with it support units necessary to sustain its operations away from its parent division. There are other models, other organizational changes that could be made. What is not in question is the status quo has not served us well and will not serve us in the future. It deserves to be said again, “The Canadian Armed Forces were unable to sustain a small brigade in Afghanistan”. Twenty-three thousand army troops, a Defence budget of over Twenty Billion dollars a year and as currently constituted the Canadian Army, in its own words, needed a year to reconstitute itself after withdrawing from Afghanistan. It’s not good enough, the tax paying public as well as our overworked soldiery, deserve better.